American legend John Tomac could well be considered as one of the greatest all-round bike racers in modern history, and he embodies the very soul of what mountain biking was all about. 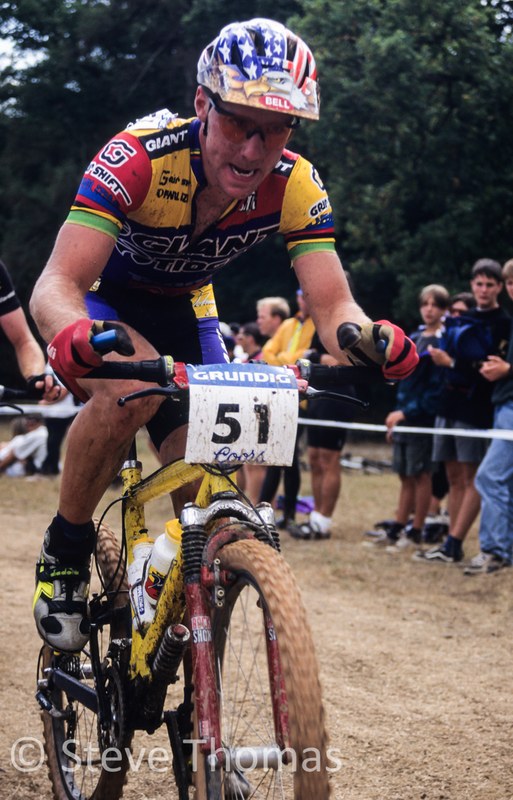 For close on 15-years the American rider John Tomac was at the forefront of mountain bike racing. He was an enigma; a rider bursting at the very seams with class, both on and off the bike. Humble, stylish, innovative, committed and blessed with the versatility of a Swiss Army Knife, Johnny T was an icon and an inspiration to close on 2 generations of young mountain bikers. Starting out on the BMX circuit Tomac soon made a name for himself and rose to pro level in his mid teens. By the time he reached 18 he made the decision to turn his attention to the emerging sport of mountain biking – and the rest, as they say, is pure history. It didn’t take long for him to start winning major US MTB races, in an era before the sport was recognised by the UCI. That official UCI seal finally came down in 1990, when the first certified World MTB Championships were held in Durango, Colorado. As a rider, Tomac was quite simply unique - he was dominant in both XC and downhill, winning the World XC Championships in 1991, as well as taking silver in the Downhill race, a feat unlikely ever to be matched. During his career he won numerous World Cup races and World Championship medals in both disciplines, and continued to race downhill at a slightly lower level up until 2005, when he bowed out of competition after taking the famous Kamikaze downhill title in Mammoth, California (for the second year in a row). What really sets Tomac apart is that he also raced on the road at the highest level during the late 80’s-early 90’s, with the 7-11 and then Motorola teams, and although his biggest victory was in the US Critirium Championships, he also rode classics such as the Paris-Roubaix and Tour of Flanders, as well as the the Giro d’Italia. During his early offroad career many riders mixed the disciplines, but none could match Tomac for versatility and results. At that time courses and equipment were clearly very different; XC races were much longer and courses a lot more natural in design, and downhill courses were also not anywhere near so as extreme as they are today – and naturally the bikes were far less advanced too. Tomac embodied what mountain early biking was all about; he was a rider who loved to go out into the wilds on epic all-day rides, not just for the training, for the pure unadulterated love of riding his mountain bike. To this day he still takes on some great MTB and gravel bike rides around the mountains of New Mexico and Colorado. He is a living legend and is still a huge inspiration to many of us old enough to remember his glory days, and who know what the name Tomac on a bike actually embodies. It’s tough to say whether the extent to which the different disciplines of mountain biking have separated was inevitable, or “manufactured” by the bike industry and media. I suspect it was a cocktail of both with a few more ingredients blended in, which is both good and bad, depending on how you look at things. Back in the early days of MTB you were branded either as a mountain biker or a roadie. Even if you were a fat tyre convert from the beginning, if you’d been riding road bikes before the invention of mountain bikes you were still seen differently; almost as if you were not considered to be pure enough to be a true mountain biker. This is quite ironic, given that a good number of those original mountain bikers are now road bike converts, and the fact that many of the early greats had a closet curly bar background. For me, I was always just a cyclist, or a bike rider – 2 wheels and a saddle and a lust for adventure were all that was needed. This still stands true these days, even if the adventures are a little less extreme than they were. Nowadays rigid bikes, and Lycra shorts are seen as something of a faux-pas, at least is you want to be considered a real mountain biker. As a photographer it’s really hard to get a magazine to use images of riders in anything but baggy shorts and with their wheels off the ground, which is a bit sad, but then again magazines are becoming extinct too. With so many hand crafted trail centres around these days a whole generation of riders have missed out on the rewards of mapping and planning a route through uncharted territory. Setting out on a 3-hour ride that leaves you coming in 8-hours later, uplift-free bike pushes, dead ends and the solitude of an empty mountain with unpredictable and uncharted trails; and all ridden on whatever bike you happen to own – not something you’re led to believe that you need just to be able to ride offroad. Ahh; the strange thing is that these adventures are all still out there and just as attainable as they were 25-years ago. It’s just that they tend to have become somewhat over grown in mountain biking myth, and those of us that took them on have maybe also become a little overgrown. All this is enough to make me want to head out on a wild new ride and to put the mountain back into mountain biking – that’s what Johnny T would do.